Mechanical Shark - The goal is simple - stay on the shark for as long as you can, as it thrashes around. The shark has the added safety feature of a foam head and inflatable mattress. A great addition to any pool party, beach theme party, or other water themed event. 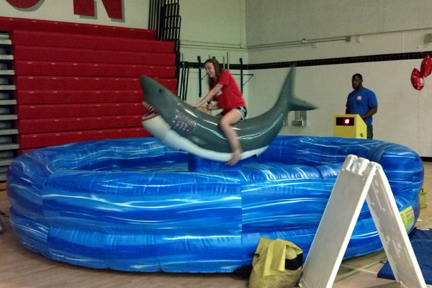 Mechanical Shark - Swimmers beware - there's a shark in the water! The goal is simple - stay on the shark for as long as you can, as it thrashes around. The shark has the added safety feature of a foam head and inflatable mattress. A great addition to any pool party, beach theme party, or other water themed event.Our operators can manually set 10 different speeds - creating fun for all skill levels. Includes: inflatable mattress, 1 blower, mechanical shark, control panel, and 1 attendant.